It is the second of day of autumn (at the time of writing this), and already we can feel the cold. It has been raining non-stop on the first weekend of March. Goodbye sunny Summer. 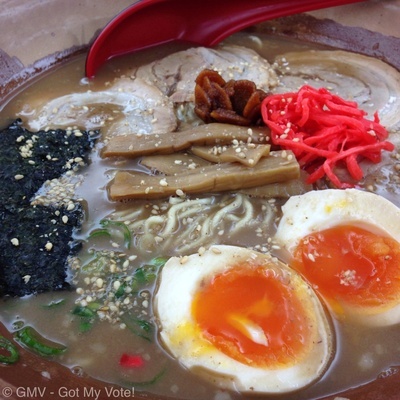 Look on the optimistic side; cold raining weather is totally perfect for a bowl of hearty, thick Tonkotsu ramen. 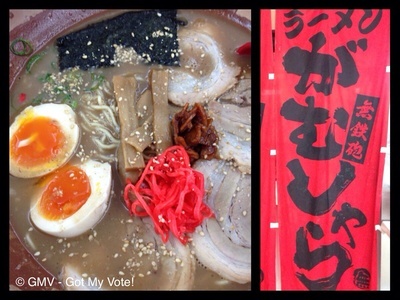 Today, I am going to share with you the best authentic Tokyo ramen in Sydney. 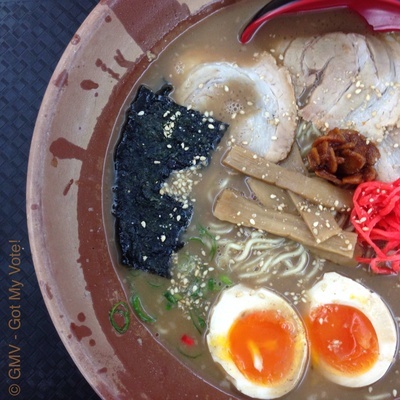 Gumshara Ramen at Haymarket is well-known among Sydney's food lovers for its authentic Tonkotsu ramen. It is quite phenomenal for a little food court stall to receive such a large fan base in the shortest amount of time. Yes, you heard it right - it is a humble food court gourmet fare. Seriously, you can find gems in the most unlikely of places. 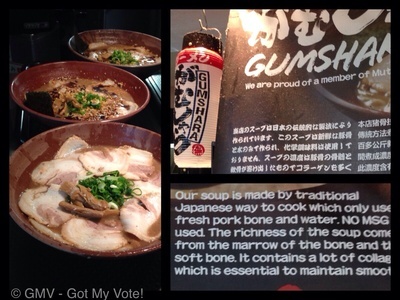 Contrast to the fancy Ippudo in Westfield Sydney, Gumshrara Ramen adopts a no-frills budget setting, and concentrates solely on delivering top-notch, consistent and awesome ramen. Here we are. We arrived early for lunch at 11:30am. Already there was a long queue formed at the front counter. Talk about keen diners. 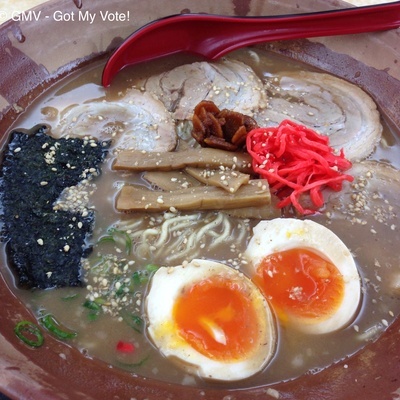 This is how ramen in Japan tastes like - thick, rich flavourful soup combined with generous toppings. 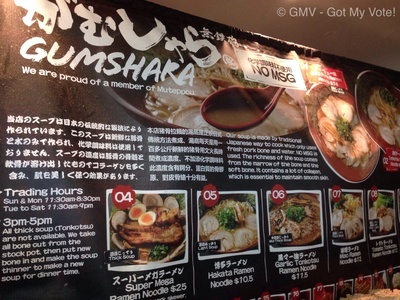 Gumshara Ramen probably has the thickest Tonkotsu soup broth in Sydney. Tip: You can ask the staff to dilute it down for you, if you happen to find it too thick for your liking. Be warned, a bowl of this hearty ramen can get really filling. The broth is really thick and dense because they stew 30kg of pork bones for long hours until the marrow and collagen are released from the bones; and then it all melts into a thick, delicious, hearty porky broth full of goodness. We struggled to finish it, but every spoonful was very satisfying and morish. The Onsen-Soft-Boiled egg is a must-order. The golden braised egg with a gel-like yolk is my favourite. You can adjust the seasoning of your broth soup by adding some of the complementary condiments provided. The sesame seeds add some nuttiness to the soup, and the braised caramelised soy garlic is absolutely divine. These are the must add-ons for my ramen. Eating World at Harbour Plaza is your average food court with lamented tables, plastic chairs and strong fluorescent lighting. It is definitely not a fine dining destination, but it certainly draws in students, families and tourists for a cheap and cheerful meal. Gumshara Ramen stall #211 is located at the far-end of this food court. Look out for the red hanging curtain decorations. Where: In the Eating World Food Court, 211/25-29 Dixon Street Haymarket NSW. Good for kids: More of an Adult taste. Take away: Yes, but not recommended. Thanks Su, great all round. 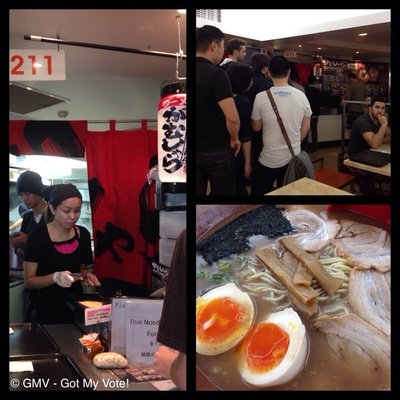 Easily the best ramen place in Sydney! I love this ramen place!